Do you have a little habit that you’ve been thinking about more and more negatively? Maybe you’ve been planning on doing something about it for a while because you’ve noticed it really isn’t serving you? To be honest, these small unhealthy patterns that we have can take a surprising amount of effort to change. 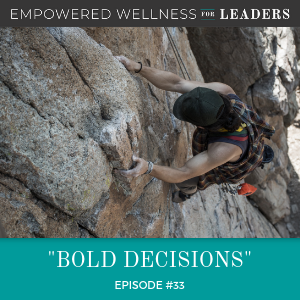 Today’s episode is all about dealing with making the bold moves we need to take to really focus on our wellness. I ask my clients to make bold moves for themselves all the time, and it took a bit of time for this wellness coach to decide it was time to take one for herself. I took the plunge last week and I want to share with you how I came to this decision and how it’s paid off in such a big way for me. Join me this week to discover how making healthy changes can positively affect our lives from a health perspective, as well as at home and at work. I’m sharing how to make sure your bold move yields a real change that you can benefit from for years to come. Download my worksheet for some guidance in identifying what bold moves you need to take. If you’d like some help in identifying and changing the one most important wellness-affecting bad habit you’ve formed, send me an email! Why we have to make bold moves to make great changes. 8 ways my bold move improved my life almost immediately. How all of us have one or two consistent habits that are getting the best of us. Why strict dieting won’t work as well as a measured approach to making changes. 4 ways to make sure these bold moves stick and change our habits. I think that this episode has been brewing for quite a while and is coming out of my own personal experience as well as some things I’m seeing with some of my clients. I’m going to be really blunt here; I have been talking for quite a while about how I know that wine isn’t great for me and causing a myriad of issues for me wellness-wise. Well, the issue couldn’t have been clearer from a bold move that I made a week ago. Hey, I ask my clients to make bold moves for themselves all the time and it took a bit of time for this wellness coach herself to take one; take a big bold step myself. I want to share with you how I came to this decision and how it’s paid off in such a big way that I can’t help but to share with you today. Is there some unhealthy pattern getting your attention? Is there something you’re thinking about quite a bit, either have been planning on doing something about it for some time now or dropping something in your diet or anything that’s really been recurrent or on your mind? Do you talk about it a bit with friends or you find that it’s in your own chatter, like, “I should…” or, “I think it would be better if I did…” or, “I can’t wait to…” but it’s all talk and no action? Yeah, me too. And that’s what I want to get at today in this episode. I know for all of us, there’s usually one or two small but very consistent patterns that’s getting to the best of us, and we know what it is. That’s why, when I first became a coach, I started offering mini-sessions called the One Thing, because truly, if I asked and gave my clients or the person on the other end of the line some time to reflect, we know what might help us move towards a healthy us; we really do. And I’ll ask you here so you can apply this to your life right now as you listen to the episode; what is one thing that is disrupting your wellness? And what is your hunch about the best way to handle this disruption that might take a bold approach? For me, it was the red wine habit and the having a drink every time it was offered habit. Have I told you I also love bourbon cocktails? And it was getting out of hand, not because I was drinking too much – because truly, I’m such a lightweight, one or two is my absolute limit. But this is an issue for me because I knew it was creating results I did not want; a puffy bloated feeling the morning after I had wine, a lack of hitting the five-pound weight loss goal I set this summer – yes, it’s September now – a craving or need for coffee the morning after. And I have nothing against caffeine, but for me, it was turning into this vicious cycle of wine at night, coffee in the morning, and getting dehydrated. And what was getting my attention was the red wine. For me, it was my one thing, for real. So I made a decision last week. I’m going to enjoy alcohol just one night per week; just one. I’ll pick the day, and if I want to have wine with dinner or a cocktail, I’ll have it. And the results were absolutely amazing. I even changed the subject of this week’s podcast because it made such a difference in how I felt this week and I wanted to bring this to you while all of the insights are really fresh for me. Okay, to be honest, I made two bold moves this week because I am serious about getting that five pounds off as well; I dropped bread. It was just one of those things I was doing out of habit and I could get much more creative and eat fresher in the way I know my body wants by dropping bread. It did not include as much drama as the wine, so I’m going to talk about the red wine example. I dropped red wine this week and this is what’s happening. I haven’t weighed in yet, but I know I’ve lost weight. My clothes are looser and I feel better in my body right now. Number two – I slept better. By day three, I was sleeping the hours I wanted to. It was pretty easy to get up. Three – I had more mental clarity and, emotionally, I just wasn’t triggered to fear as often. I am doing a lot of thought work right now, but I know that I just was feeling emotionally better, more stable. Next, number four – I started craving fresh food like crazy, both fruits and vegetables. You know, it was like one or two servings during each meal or two different types and I just was all out in making sure I had those things on hand and cooking or ordering that way. And it was pretty natural, by the way. Next, number five, I changed my breakfast to this amazing fruit bowl, almond milk, and walnuts. I used to just crave whole wheat toast and peanut butter, but I got creative, listened to some of my gentle cravings for fresh fruit and this is what I designed. It’s one of my new favorites for breakfast. Six – I didn’t crave as much meat. I found that just fascinating because really, before I eat or choose to cook, I really ask myself what I really want and fuel-wise, I know whether I’m really craving some protein out of a nutritional kind of need or not, and I just wasn’t craving meat as much. Seven – healthy choices just seemed easier; interesting. Eight – I thought I’d feel awkward to not drink in the evenings with my husband, but it wasn’t a deal. He noticed the wineglass that I’d filled with Spritzer and he kind of smiled, but it was no big deal either way. I was absolutely in such a new peaceful place around food. And, you know, in general, I don’t struggle around food anymore; that is my transformation that I’ve had in the last few years. It was a new peaceful place. My body knew and it was asking me all these months to just please pay attention. How did I get here? And more importantly, how can you? That’s what I went to help you with today. This isn’t about pushing yourself to do this at all, and I’m glad I made some space for myself to look at this. You know, I do wish I’d made the decision sooner, but next time I might be getting some nudges, I’m going to make a switch quicker, I really will. I’m going to make a bold move quicker next time, I promise; I promise my body. There are four simple ways, and I’m going to outline them for you here, and then share with you some great ideas on how this might apply to your life. I really did four things that really made this work. Number one – I stayed curious before, during, and after this entire experiment. Next, I always was watching for my body’s feedback. I wasn’t expecting results, I was just watching for what might happen; either nothing or just something. And I was surprised – as I listed eight different responses, I was surprised at how many there were. Number three – do decide how you want to respond to others. If you’re in a social group or in a sport together or how you connect together is over wine or cocktails or beers with the guys after work, just decide what you want to say, just so that you can honor your decision, your bold decision, if that’s one of your decisions. Four – give yourself permission to change your mind and tweak after whatever you’ve learned from whatever you boldly decide to do. Alright, let me explain these a little more in-depth. Staying curious – you know, I didn’t make any big resolution, I simply made a calm decision to try wine just once a week when I was ready. But it did feel bold making that decision on behalf of my body. Even as I made it, I was proud of myself for giving this a try. Next, I watched for my body’s feedback, not results on the scale or this quick response, like if I don’t drink tonight I’m going to feel amazing tomorrow. That wasn’t it at all and that is why I’m so surprised by so many changes over the last seven days. I stayed in that curious mode and went through the week as normal, but watched when I was hungry, looked at what I had an appetite for around meals, and all the things; sleeping, mental acuity, fear bumps. You know, if you’d like to, you can journal. I know that I was really onto myself in staying very curious in this and even though I wasn’t planning a podcast on it, I knew I was creating something that I could help, for my clients or my podcast audience. You know, I didn’t need to journal or anything, but it is really fun recalling it here as I write this on a podcast. So even if you just check in once a week to journal about what you’re noticing, it’s a great practice. Most of it is just honoring what’s going on for you, good or bad. Remember, the actions and decisions we make around our body and physical health are not transactional. Our bodies just don’t work that way. That’s why strict dieting doesn’t work. Diets, especially rigid ones, tell our bodies what they need without any regard to how they feel, right. This approach gives our body a voice in the matter. By really listening, having a hunch about what might need to shift or change, making a bold decision and trying something and giving that voice a place to speak back. It’s a wise voice that body feedback. And this isn’t woo-woo, people. This is – our body was designed to give us feedback. Our body is so complex, and after watching this in my life and so many of my client’s lives as I work with them, what I know is this; when we listen like I’m showing you here, the payoffs are amazing. And, you know, with my husband, it just felt easier to tell him I was off brad and pasta and wine during the week as we were making meals together. His response was, “Oh, okay.” You’ll notice quickly that if you don’t have drama, others won’t either. But sometimes, it feels a little more dramatic, right. I know this hasn’t always been easy for me. I would worry that my friends would think I was trying to one-up them with a new healthy habit with a lot of questions, like why are you doing that? I’m sure there was actually some truth to that when I was a Weight Watchers leader. My ego was so intertwined with how thin I was, how I was staying on plan and how well I was doing. It really was entwined. It was my first job after quite some time and so it was all intermixed in there. It was like it was a contest or something. God, I look back on that – that was a previous self in a lot of ways. Last but not least, I gave myself permission to try this for a time and change my mind when I wanted. I didn’t even set an amount of days. I gave myself a lot of grace to figure out what was going to work. And you know what – because I listened so closely, because by now I was so ready to give this a try – remember, I was just really getting sick of my own conversations in my head about red wine – I’m actually astounded by the results. Seriously, our bodies are so dang resilient and have quite a confident and loud voice, if we listen. And as if I didn’t need more evidence, I had a glass and a half of wine last night. I did decide – we had steaks and I decided I really wanted a nice full-bodied red to go with that steak. And guess what, I’m feeling it this morning. Seriously, people, it was only a glass and a half of wine and it’s all the things. I couldn’t wait for a cup of coffee. Last week, all week I was drinking tea. I wasn’t at all interested in a glass of water. It was like, three more cups of coffee please. I actually was great at drinking water last week, noticing the difference. I have a slight headache. I’m really about to take a nap. I feel puffy and I’m tired. Dang, my body’s feedback wins every single time. And you know what I’m even thinking? I may drop it all together; seriously. For now, I’m going to enjoy it once a week if I want to and see what happens. Stay tuned. Alright, enough of my story. I hope it’s been helpful, but what’s coming up for you? Are you willing to make a bold decision and willing to stay curious during the process? Are you willing to take a plunge on something that you’ve been thinking about for a while? Do it. Give yourself some grace in the process and see what you learn. What I’m realizing as I share this with you today is I’ve witnessed so many of these bold moves with my clients when they’re on their journey, tweaking and learning what’s working for them when they want to feel better or lose weight. Some have leaned into learning about their appetite, diving into the hunger scale as their primary tool. They realize that that was all it took to get back on track with food because they were healthy eaters all along. Others have missed moving their body and went all in on designing a movement plan that fit their life. It took some planning, some trying out several fitness facilities, feeling a little awkward here and there trying something new, but now those clients have hit a groove and it’s working for them; they feel so much better. I have one client that when she decided no sugar no flour was what her body was asking her, she realized that all the cravings finally did stop. Not right away, by the way; it does take a journey when you go to no sugar no flour. But when she knew the cravings would hit and maybe get noisier at the beginning and just was patient with herself as she went through, those cravings did finally stop. And it has helped her to continue hitting her weight loss goals. Again, there’s so many ideas on what the one thing might be; closing down on work at a decent hour, putting yourself to bed so you can get up to workout, getting that bathing suit on, no matter what, and swimming because you know you love it, or dropping what was your favorite snack and realizing it just didn’t taste that great after all. And it took a few days, but the cravings and the mental urging, “Go have that snack…” stopped after all. And it really didn’t taste that good. Or you’re starting to put your wellness first, even though you’re in the heavy-lifting phase of raising a family. It’s hard for us mommas if you’ve got a lot on your plate, and fathers, when we have a family, it is one of the first things that disrupts our wellness because our schedule really can get knocked off. And I’ve seen clients put their wellness first and just have so much more energy to contribute to their families and their jobs. Or another idea is just getting brave enough to have groceries delivered, planning ahead of time so you can eat in the way you wanted with your limited time because of your job. I hope all these ideas helped you and I have something special. I have opened up some extra slots on my calendar and I want to invite you to a One Thing coaching session. There are two ways to sign up, just to make it easy for you. You can email me with One Thing in the header; Diana@dianamurphycoaching.com. Or you can find me on my website, dianamurphycoaching.com. Click Let’s Chat, and click the button for a session there. These sessions are great opportunities for you to get clarity on that one thing and I’ll help you to get started. I’ll run you through some very simple questions and I’ll help you to stay curious. That’s the biggest challenge. We are so judgmental of ourselves, so that’s my job. Don’t worry about what’s coming up for you. Sign up for one of those sessions and I’ll help you stay curious and develop a two or three step action plan that you can get started on immediately. I’m so glad to bring this episode to you and I hope that my personal story, which you might be seeing some things of Facebook Lives in the next few days, are an encouragement to you. Now, I lost my weight permanently ten years ago, but I have those phases in my life where I’m stress eating a little more or, you know, like where the habit of wine got to me. We all have and we’re so human and I hope that it’s helped you to listen to my story, but know that there’s so many others out there trying bold moves. Alright, it’s a holiday. I’m off to relax and enjoy the day with my husband. We’re celebrating a big wedding anniversary and I’m so blessed. I hope yours was grand as you get this podcast a week later. And if you are enjoying the podcast, please do share it with your friends. Either help them search the title Empowered Wellness for Leaders in their podcast app, or share anything you see in social media or an email from me and just send it onto them. My goal this year is to broaden my audience. I just would love it if you’d be a part of that. Have a wonderful and happy Labor Day. And for me, working on Labor Day was not a bit of labor itself. I love what I do. Have a great day people. Thanks so much for being here today.